Roddy McGhie is one of Glasgow's best close-up magicians specialising in performing at weddings, corporate events and private parties. He has many years of experience performing all over the UK and further afield. He is highly skilled at sleight of hand and has the gift of easy rapport with his audience. Testimonials and photographs available on website and Facebook. Magic Den is a professional full time entertainer specialising in children's magic shows, close up magic, cabaret magic and mobile disco. I cover all of Scotland and can travel over the UK. Professional entertainment at an affordable cost. For more information, please visit Magic Den's website. Award Winning International Illusionist. Specialist in cruise ships, casinos, television and theaters. Performer and designer of magical effects from graceful classical magic to death defying illusions. From close-up amazement to mega-magic. Graham is one of the few jugglers able to do a full magic show to the highest level. Graham has a wealth of experience, working as a full time performer for the last twelve years. He started working as a juggler in Glasgow shopping centres doing walk about, then he introduced close up magic to expand his repertoire. Now he is quite at home working in exclusive hotels, corporate jobs or on stage in a cabaret show. What does he have to offer? Graham can mix his juggling skills with magic or perform each separately. The juggling not only includes juggling a machete; an axe and a baseball bat while balanced on a roller-bowler (a plank balanced on a tube). Or if in an prorate venue fire. Whip cracking, target cutting paper and other objects. Free style with one and two whips. Graham won both of the target competitions at the British whip convention 2007, making him the British champion. Mini bike jump and most important of all humour. The magic could be close up sometimes known as table-hopping, mix and mingle or street magic. Alternatively you may prefer some stage magic. This can be performed on a stage or totally surrounded on a dance floor, similar to an Edinburgh street show. The length of show can be anything from a 3-minute slot in a mixed show to a 45-minute solo show. Another option is two 30-minute shows, one juggling and then later a magic show. If you let me know what you want I will tailor the show to fit your requirements. Magic for children and adults including balloon modelling. Birthdays, Anniversaries, Weddings, indeed all events catered for including Fun days, Gala days and the like. 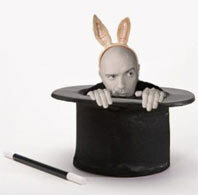 James is a comedy magician/Hypnotist based in Lanarkshire. He specialises in children's entertainment and a complete hassle free experience. Services include magic shows, balloon modelling, close up magic, stage hypnosis, circus skills workshops, mini disco, theme parties and much more. Mark Walbank is an experienced magician and regularly performs at corporate functions, weddings, private parties and special events. Mark is based in Glasgow but performs and lectures across Europe and in America. Using a blend of powerful close-up magic and mind reading, Mark will have your audience applauding, laughing and gasping in amazement. Always classily turned out he's able to build up an instant rapport with your guests and make them feel at ease while they are being entertained. Mark has performed all over the UK though regularly performs magic in Glasgow, Edinburgh, Stirling, Ayr, Perth, Dundee and other locations in Scotland.